The aim of this study was to perform a detailed analysis of cytokine toxicity in the new human EndoC-βH1 beta cell line. The expression profile of the antioxidative enzymes in the new human EndoC-βH1 beta cells was characterised and compared with that of primary beta cells in the human pancreas. The effects of proinflammatory cytokines on reactive oxygen species formation, insulin secretory responsiveness and apoptosis of EndoC-βH1 beta cells were determined. EndoC-βH1 beta cells were sensitive to the toxic action of proinflammatory cytokines. Glucose-dependent stimulation of insulin secretion and an increase in the ATP/ADP ratio was abolished by proinflammatory cytokines without induction of IL-1β expression. Cytokine-mediated caspase-3 activation was accompanied by reactive oxygen species formation and developed more slowly than in rodent beta cells. Cytokines transiently increased the expression of unfolded protein response genes, without inducing endoplasmic reticulum stress-marker genes. Cytokine-mediated NFκB activation was too weak to induce inducible nitric oxide synthase expression. The resultant lack of nitric oxide generation in EndoC-βH1 cells, in contrast to rodent beta cells, makes these cells dependent on exogenously generated nitric oxide, which is released from infiltrating immune cells in human type 1 diabetes, for full expression of proinflammatory cytokine toxicity. EndoC-βH1 beta cells are characterised by an imbalance between H2O2-generating and -inactivating enzymes, and react to cytokine exposure in a similar manner to primary human beta cells. They are a suitable beta cell surrogate for cytokine-toxicity studies. Ewa Gurgul-Convey and Ilir Mehmeti contributed equally to this study. The online version of this article (doi: 10.1007/s00125-016-4060-y) contains peer-reviewed but unedited supplementary material, which is available to authorised users. The generation of the new permanent human EndoC-βH1 beta cell line by Ravassard et al and Scharfmann et al [1, 2] has opened up new perspectives for diabetes research. This new human beta cell line has been shown to express all target structures crucial for physiological beta cell function and insulin secretion, and is characterised by excellent responsiveness to glucose and other secretagogues [1, 2, 3], but not to pyruvate and lactate . Although this cell line has been used in a few studies exploring cytokine toxicity [4, 5, 6], the mechanisms of cytokine toxicity to human beta cells as they pertain to type 1 diabetes are not yet fully understood. Although the mechanisms of beta cell death in rat and mouse models of type 1 diabetes mellitus have been revealed in the last decades [7, 8, 9, 10, 11, 12, 13, 14, 15], our knowledge of in vitro cytokine action in human beta cells is limited. In the present study, we aimed to provide a detailed analysis of the mechanisms underlying cytokine action and toxicity in the human EndoC-βH1 beta cell line. EndoC-βH1 cells (Endocells, Paris, France) were cultured as previously described (see electronic supplementary material [ESM] Methods for details) . Pseudoislets were generated and cultured as described in ESM Methods. The cell lines used were routinely checked for mycoplasma and were free from mycoplasma contamination. For cytokine toxicity analysis, cells and pseudoislets were treated with proinflammatory cytokines (see ESM Methods for details). 3-Morpholinosydnonimine (SIN-1) (50 μmol/l) or diethylenetriamine (DETA)-nitric oxide (NO) (100 μmol/l) were applied in the absence or presence of cytokines for 7 days or 24 h, respectively. Total RNA was isolated using the RNeasy Mini Kit (Qiagen, Hilden, Germany). After quality control, 1 μg of RNA was reverse transcribed using random hexamer primers. QuantiTect SYBR Green (Qiagen) was employed, as described in detail in the ESM Methods. Antibodies against copper-zinc superoxide dismutase (CuZnSOD) (1:3000), manganese superoxide dismutase (MnSOD) (1:3000), glutathione peroxidase (GPx)1 (1:7500), catalase (CAT) (1:5000), IL-1β (1:100), nuclear factor erythroid-2 related factor 2 (NRF2) (1:1000) and β-actin (1:250) (as the loading control) were used to analyse protein expression by western blotting, as described in detail in the ESM Methods. For immunofluorescence, human EndoC-βH1 cells were stained with specific antibodies for CuZnSOD, MnSOD, GPx, CAT and insulin (for details, see ESM Methods). Human pancreases from non-diabetic donors were obtained by organ resection during surgical intervention or from organ donors (ESM Table 1). Tissue was handled and processed as approved by the Hannover Medical School Ethics Committee. The in situ PCR analysis was performed and quantified as previously described (for details, see ESM Table 2) . The primer sequences used are listed in ESM Table 3. Cells were seeded at a density of 7000 cells/well onto 96-well coated plates 5 days before the addition of test compounds. A total of 50 pseudoislets of comparable size were handpicked, followed by treatment with the indicated cytokines. Activation of caspase-3 was quantified using the Caspase-Glo-3/7 kit (Promega, Mannheim, Germany) according to the manufacturer’s instructions. Samples were measured on the GloMax-Multi Detection System (Promega) and data were imported into Instinct software version 3.1.2 (Promega) prior to data analysis. Data are expressed as percentages of cells without exposure to test compounds. Total cell death was quantified using flow cytometry (CyFlow ML, Partec, Münster, Germany), as described in the ESM Methods. Overall oxidative and nitrosative stress by DCF fluorescence and hydroxyl radical production by 3′-(p-hydroxyphenyl) fluorescein were assessed as previously described (see ESM Methods for details) . The assessment of insulin secretion and ATP content, and the quantification of NFкB activity, was performed using established methods . Details are provided in the ESM Methods. All data are expressed as means ± SEM. Unless otherwise stated statistical analyses were performed by one-way ANOVA followed by the Bonferroni test using the Prism analysis program (GraphPad, San Diego, CA, USA). Only p values of <0.05 were considered significant. EndoC-βH1 beta cells exhibited high expression of the superoxide dismutase isoenzymes (mitochondrial MnSOD [also known as SOD2] and cytoplasmic CuZnSOD [also known as SOD1]) by both RT-PCR at the gene level as well as by western blotting at the protein level (Table 1, Fig. 1a). In contrast, gene and protein expression of the H2O2-inactivating enzymes CAT and GPx (GPX1) was much lower (p < 0.01) (Table 1, Fig. 1a). This observation was verified by specific immunofluorescent staining for the aforementioned antioxidative enzymes. As shown in Fig. 1b, EndoC-βH1 beta cells revealed strong immunostaining for CuZnSOD and MnSOD, and markedly weaker immunostaining for GPx1, followed by CAT. To determine the gene expression profile of these antioxidative enzymes in the different cell types of human pancreatic islets, we performed in situ PCR analyses in human pancreatic sections. The expression of genes encoding superoxide inactivating enzymes (CuZnSOD and MnSOD) and H2O2-inactivating enzymes (GPX1 and CAT) was detected in both non-beta cells and beta cells (Fig. 2a). The superoxide dismutases showed the highest expression levels of all the investigated antioxidative enzymes, and the level was around 1.4-fold higher in non-beta cells than in beta cells (Fig. 2b, ESM Table 2). However, the expression levels of the H2O2-inactivating enzymes GPX1 and CAT were markedly lower in beta cells than in non-beta cells. CAT revealed the lowest expression (15-fold lower), followed by GPX1 (threefold lower) in beta cells, when compared with the respective expression levels in non-beta cells (Fig. 2b, ESM Table 2). Proinflammatory cytokines induced time-dependent activation of the effector caspase-3, with a significant effect after 3 days and the strongest effect after 7 days of incubation with cytokines (Fig. 3a). IL-1β (60 U/ml) and TNF-α (185 U/ml) mildly induced caspase-3 activation, whereas IFN-γ (14 U/ml) alone had no effect (Fig. 3b). The IL-1β-induced caspase-3 activation was slightly potentiated by TNF-α or IFN-γ (Fig. 3b). A combination of TNF-α and IFN-γ also caused a slight potentiation (Fig. 3b). The effect of IL-1β was concentration-dependent, as shown by the greater caspase-3 activation in the presence of the 10× IL-1β (600 U/ml) concentration (Fig. 3b). The most prominent effect was observed with a mixture of the three cytokines (IL-1β, TNF-α and IFN-γ) (Fig. 3b). This observation is in accordance with total cell death rates, as assessed by counterstaining with propidium iodide and Hoechst dye upon treatment with cytokines (ESM Fig. 1). Next, we studied whether the formation of EndoC-βH1 islet-like structures (pseudoislets) rendered EndoC-βH1 beta cells more sensitive to proinflammatory cytokines. As shown in ESM Fig. 2a, 24 h exposure of pseudoislets to IL-1β alone and/or the cytokine mixture resulted in significant caspase-3 activation, suggesting that pseudoislets exhibit an earlier and greater sensitivity towards cytokine toxicity than equivalent EndoC-βH1 monolayers. These results were confirmed by counterstaining with propidium iodide and Hoechst dye (ESM Fig. 2b). Incubation of EndoC-βH1 cells for 24 h with IL-1β alone (60 U/ml) or with IL-1β in combination with TNF-α or with IFN-γ resulted in activation of the transcription factor NFκB (Fig. 3c). A comparable level of activation was also seen at the 10× concentration of IL-1β (600 U/ml) (Fig. 3c). TNF-α or IFN-γ alone or TNF-α and IFN-γ in combination showed no effect (Fig. 3c). The mixture of IL-1β, TNF-α and IFN-γ caused the strongest activation of NFκB (Fig. 3c). In addition, the gene expression of NRF1 and NRF2 (also known as NFE2L1 and NFE2L2) was determined in EndoC-βH1 cells before and after stimulation with beta cell toxic cytokines. As shown in ESM Fig. 3 exposure of EndoC-βH1 cells to IL-1β alone or a cytokine mixture for 1, 3, and 7 days had no effect on de novo synthesis of NRF1 (ESM Fig. 3a) or NRF2 (ESM Fig. 3b). This observation was confirmed by western blotting (ESM Fig. 3c). Thus, NRF2 is unlikely to be involved in regulating the antioxidant response upon cytokine-mediated toxicity in EndoC-βH1 cells. Cytokines increased DCF fluorescence, a universal indicator of nitro-oxidative stress by reactive species, after 7 days of exposure (Fig. 3d). The most potent stimulation of DCF fluorescence was caused by the mixture of the three cytokines (Fig. 3d). The effects of IL-1β (60 and 600 U/ml) alone and in combination with TNF-α or IFN-γ were also significant, but less pronounced (Fig. 3d). Upon incubation with the cytokine mixture, a pronounced significant induction of hydroxyl radical formation was evident (Fig. 3e). Expression of inducible (i) NO synthase (NOS) was undetectable in EndoC-βH1 beta cells. Cytokines failed to induce iNOS expression at either the gene or protein level at any analysed time point between 1 and 7 days of incubation (data not shown). Endothelial NOS and neuronal NOS were also not detected (data not shown). Incubation with an iNOS blocker, l-nitroarginine, reduced neither cytokine-mediated toxicity nor DCF oxidation (data not shown). Nevertheless, EndoC-βH1 cells were sensitive to NO toxicity, as documented by both caspase-3 activation and induction of DCF oxidation after exposure to the NO donors SIN-1 and DETA-NO (Fig. 3f–i). SIN-1 and DETA-NO had an additive effect on cytokine-mixture-mediated caspase-3 activation (Fig. 3f,g) and potentiated cytokine-mediated oxidative stress, as measured by DCF (Fig. 3h,i). We used these two NO donors because they differ in their actions and time lines. DETA-NO is known to be a pure NO donor and acts more quickly than SIN-1. SIN-1 is an NO donor that also releases a certain number of superoxide radicals as a by-product. It acts more slowly than other NO donors and therefore allows long-term co-incubations with cytokines (7 days) in studies with EndoC-βH1 cells. Next, the expression of unfolded protein response (UPR) genes encoding endoplasmic reticulum (ER) adaptive functions and of ER stress markers was analysed after 1, 3 and 7 days of cytokine exposure by real-time RT-PCR (Fig. 4, ESM Fig. 4a–c). The gene expression of GRP94 (also known as HSP90B1) and BIP (also known as HSPA5), which enhance the ER folding capacity, was significantly increased upon exposure to proinflammatory cytokines for 1 day when compared with control cells (Fig. 4a,b). After 3 and 7 days of treatment with IL-1β alone or the cytokine mixture, the induced expression of UPR-encoding genes returned to control levels (Fig. 4a,b). In contrast, the expression of the ER stress genes CHOP (also known as DDIT3) (Fig. 4c), XBP1spliced, ATF6 and ATF4 (ESM Fig. 4a–c) was not affected by IL-1β alone or the cytokine mixture at any analysed time point, strongly indicating that none of the ER stress pathways was activated under these experimental conditions. Interestingly, however, in the presence of the NO donor DETA-NO, beta cell toxic cytokines caused a significant induction of the ER stress markers CHOP (Fig. 4d), XBP1spliced and ATF4, but not of ATF6 (ESM Fig. 4d–f). Thus, the presence of intracellular NO might be required to induce cytokine-mediated ER stress. Glucose induced a significant concentration-dependent stimulation of insulin secretion from EndoC-βH1 beta cells in the concentration range 5.5–30 mmol/l (Fig. 5a). Exposure of EndoC-βH1 cells to IL-1β (600 U/ml) or to the cytokine mixture (IL-1β, TNF-α and IFN-γ) for 1 h augmented glucose-stimulated insulin secretion (GSIS) (ESM Fig. 5a). This stimulatory effect was abolished after 24 h incubation with cytokines (ESM Fig. 5b), while a prolonged 7-day exposure to cytokines resulted in a virtually complete loss of GSIS (Fig. 5a). Interestingly, even a 7-day exposure to 30 mmol/l glucose failed to induce the expression of IL-1β in human EndoC-βH1 beta cells (Fig. 5d). ATP content was not glucose-dependent (Fig. 5b). Exposure to a high concentration of IL-1β (600 U/ml) and to the cytokine mixture for 7 days led to a significant reduction of ATP content at 30 mmol/l glucose (Fig. 5b). The ATP/ADP ratio in human EndoC-βH1 beta cells increased along with increasing glucose concentrations (10 and 30 mmol/l) in the culture medium (Fig. 5c). This increase in the ATP/ADP ratio was blunted by IL-1β (600 U/ml) and the cytokine mixture (Fig. 5c). 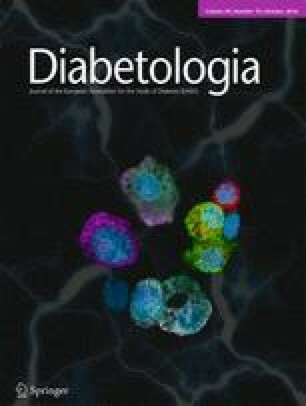 Type 1 diabetes is an autoimmune disease characterised by a loss of pancreatic beta cells caused by proinflammatory cytokine-mediated toxicity [13, 17, 18, 19]. In the current study, maximal toxicity was observed with a mixture of three cytokines, IL-1β, TNF-α and IFN-γ, which has been shown to simulate the proinflammatory cytokine pattern in the infiltrating immune cells in the islets of Langerhans in patients with type 1 diabetes [13, 16, 20, 21]. Combinations of two of the cytokines (in particular with IL-1β) were less toxic, confirming an earlier observation . However, the cytokine response was more sluggish in EndoC-βH1 beta cells than has been reported in other cell types, at around three times slower than in rodent beta cells [5, 10, 11]. The vulnerability of EndoC-βH1 beta cells towards proinflammatory cytokines could be significantly enhanced by a three-dimensional configuration of EndoC-βH1 beta cells as pseudoislets, which can be attributed to improved cell–cell contact. Our results in EndoC-βH1 beta cells are in line with previous observations in human islets [20, 22, 23, 24]. EndoC-βH1 beta cells are well equipped with all components of the cellular machinery for glucose responsiveness, as we have recently shown . In the current study, insulin secretion from EndoC-βH1 beta cells responded to glucose stimulation, confirming earlier observations [1, 3]. Exposure to cytokines abolished GSIS, along with loss of a glucose-induced increase of the ATP/ADP ratio, consistent with previous observations in human islets [25, 26, 27]. The observed reduction in GSIS was not accompanied by a parallel induction of IL-1β expression in the EndoC-βH1 beta cells, as previously reported for human beta cells . EndoC-βH1 beta cells show a profile of antioxidative enzyme equipment comparable with that of human and rat beta cells [23, 29]. In particular, they express the superoxide dismutase isoenzymes at a high level and show a very low expression of the H2O2- inactivating enzymes GPx and CAT. The expression of GPx was somewhat higher than that of peroxisomally expressed CAT. This imbalance of superoxide radical-dismutating and H2O2-detoxifying enzymes was also verified in beta cells of islets residing in the human pancreas parenchyma, using a special quantitative in situ PCR technique . This method permits analysis of the gene expression level in each individual cell of the islet , thereby bypassing the problems with isolating single cells from isolated human islets . These analyses also revealed that non-beta cells in human islets, in contrast to beta cells, express the H2O2-detoxifying enzymes at the same high level as the superoxide radical-dismutating enzymes. Thus, a comparison between expression levels in the EndoC-βH1 cell line and isolated whole islets is likely to overestimate the expression levels in the latter due to the non-beta cell component in primary human islets. It is therefore not surprising that somewhat higher expression levels of H2O2-inactivating enzymes have been found in isolated human islets [23, 31]. These results provide further support for the fact that beta cells in human pancreatic islets are more susceptible to proinflammatory cytokine toxicity than other islet cell types, further strengthening the concept of a particular vulnerability of beta cells . Thus, the well-known imbalance between the generation and inactivation of H2O2 in pancreatic beta cells, in particular in mitochondria, which comprise the primary intracellular sites of reactive oxygen species (ROS)-mediated cytokine toxicity [9, 10, 12, 14, 29, 32], is also likely to play a crucial role in cytokine toxicity in this new human beta cell line. Activation of the transcription factor NFκB is a key element in cytokine-mediated beta cell death in rodent insulin-secreting cells . We observed a rather mild activation of this transcription factor in EndoC-βH1 beta cells, much weaker than in rodent insulin-producing cells . This NFκB activation was primarily dependent on IL-1β, which is in line with a corresponding observation in human islets . The weak cytokine-mediated activation of NFκB in EndoC-βH1 beta cells, as in human islets, failed to induce the iNOS pathway [22, 24, 33], which is at variance to rodent beta cells [7, 13, 19, 21, 34, 35, 36, 37, 38, 39]. Our results confirm recent studies in EndoC-βH1 beta cells that reported virtually no expression of iNOS [4, 40]. In addition, we documented a lack of expression of other NOS isoforms: endothelial NOS and neuronal NOS. Thus, similar to human islets [24, 41], EndoC-βH1 beta cells are apparently not capable of producing NO. Nonetheless, we observed significant ROS production after stimulation with the cytokine mixture, and this production was not reduced by the iNOS blocker l-nitroarginine. This excludes an NO-mediated component in the increased DCF oxidation. The imbalance of the expression of superoxide radical-dismutating and H2O2-detoxifying enzymes in EndoC-βH1 beta cells supports the conclusion that H2O2 generation is responsible for the increased DCF fluorescence. In the case of proinflammatory cytokine toxicity, the mitochondria are the site of H2O2 formation , generated through the action of MnSOD upon superoxide radicals originating from the respiratory chain . This increased H2O2 production is ultimately the basis for the generation of the highly toxic hydroxyl radical in the Fenton reaction . Indeed, the results of this study show a significant production of hydroxyl radicals upon exposure to the cytokine mixture. The magnitude of hydroxyl radical production in EndoC-βH1 beta cells is lower than that in rodent cells, where hydroxyl radical formation is fostered through an interaction between H2O2 and NO . ER stress is thought to contribute to the toxic effects of proinflammatory cytokines in rodent beta cells . In the present study, we observed a significant activation of UPR genes fostering cytoprotective ER chaperone protein expression in EndoC-βH1 beta cells after 1 day, which vanished after longer exposure to the cytokine mixture. However, the cytokine mixture did not induce the expression of CHOP, the most important proapoptotic ER stress marker in rodent beta cells , or of other ER stress response genes, which is at variance with beta cells of rodent origin [11, 42, 43]. This observation is in contrast to a recent report by Brozzi et al . This difference may be related to the use of 2% FCS in their incubation medium . In our experiments, we followed the original tissue culture protocol devised for this particular cell line by the manufacturer (Endocells). A possible reason for the failure to detect ER stress in response to proinflammatory cytokines might be the lack of iNOS expression and concomitant NO production in EndoC-βH1 beta cells. This theory is supported by the observation that proinflammatory cytokines mildly increased the expression of ER stress markers in the presence of the NO donor DETA-NO. Our results are in agreement with the only partial and weak ER stress marker expression observed in pancreatic beta cells from patients with type 1 diabetes . Thus, beta cells of human origin are apparently capable of better coping with cytokine-mediated stress. An explanation for the observed discrepancy in cytokine toxicity between beta cells of rodent and human origin could be the lack of endogenous NO production in beta cells of human islets. In the pancreatic islets of type 1 diabetes patients, the membrane-permeable NO originates from the infiltrating immune cells . This NO could, in the presence of a trace metal, promote (in a reaction with H2O2) the formation of the highly toxic hydroxyl radical , thereby contributing to beta cell demise. The observation that the NO donors SIN-1 and DETA-NO increased the sensitivity of EndoC-βH1 beta cells to cytokine toxicity provides support for a role of NO in the toxic effect of proinflammatory cytokines in beta cells of human origin. This situation is also known from other autoimmune diseases, where iNOS is induced only in the infiltrating immune cells, and not in the cells of the target organ . This difference between the in vitro and in vivo situation might explain the weaker in vitro toxicity of the cytokines towards the EndoC-βH1 beta cells, as compared with rodent beta cells. The lack of NO production in human beta cells [22, 24] as well as in EndoC-βH1 beta cells thus emphasises the role of the beta cell as an innocent bystander, rather than an active participant, in the process of autoimmune-mediated beta cell destruction in patients with type 1 diabetes mellitus. The excellent technical assistance of C. Schwab, M. Funck and A. Possler (Hannover Medical School) is gratefully acknowledged. The authors thank R. Scharfmann and P. Ravassard (Institut du cerveau et de la moelle (ICM), Biotechnology & Biotherapy Team, 75013 Paris, France) for advice with the EndoC-βH1 beta cell culture. The authors are very grateful to K. Dobashi (Department of Pediatrics, School of Medicine, University of Occupational and Environmental Health, Kitakyushu, Japan) for the antibodies against CuZnSOD, MnSOD and GPx. The work leading to this publication has received support from the Innovative Medicines Initiative Joint Undertaking (grant agreement no. 155005, IMIDIA), the resources of which comprise financial contributions from the European Union’s Seventh Framework Programme (FP7/2007-2013) and in-kind contributions from companies in the European Federation of Pharmaceutical Industries and Associations. EG-C was supported by the Menarini Award of the German Diabetes Association and the “Habilitationsförderung für Frauen” of Hannover Medical School. EG-C and IM designed and performed experiments, analysed data, and created figures and tables; TP performed experiments with SIN-1; AJ performed in situ PCR experiments; and SL designed experiments, and supervised and coordinated the project. All authors wrote the manuscript and approved the final version of the manuscript. EG-C and IM are the guarantors of this work and take responsibility for the integrity of the data.